This undated image made available on May 30, 2016 by the Italian Navy Marina Militare shows migrants being rescued at sea. 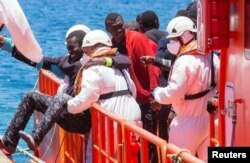 Survivor accounts have pushed to more than 700 the number of migrants feared dead in Mediterranean Sea shipwrecks over three days in the past week, even as rescue ships saved thousands of others in daring operations. The U.N. refugee agency is voicing concern at the rising death toll among refugees and migrants crossing the Mediterranean Sea, especially along the route from Libya to Italy. More than 200,000 refugees and migrants have crossed the Mediterranean Sea in the first six months of this year. The U.N. refugee agency reports some 2,510 lives have been lost so far compared to 1,825 in the same period last year, making this a particularly deadly year. While nearly two-thirds have reached Europe traveling from Turkey to Greece, the UNHCR says the North Africa-Italy route is dramatically more dangerous. It says the vast majority—more than 2,100 people—have died along this route this year. This past week has been particularly deadly. A series of shipwrecks on the Mediterranean reportedly have claimed at least 880 lives. The UNHCR considers this estimate to be conservative. A migrant, who is part of a group of 58 intercepted aboard a makeshift boat around 100 miles off the coast, is helped by rescue workers upon arriving at Arguineguin port in the Canary Island Gran Canaria, Spain, May 30, 2016. UNHCR spokesman, William Spindler, says boats leaving from Libya are terribly overcrowded, putting peoples’ lives at risk. He says smugglers are reportedly increasing the number of people on board ship to maximize income before the start of the holy month of Ramadan in the coming week. Passengers are believed to be paying smugglers up to $2,000 to travel from Libya to Italy. The UNHCR says Nigerians and Gambians constitute the main nationalities on this route, although increasingly more are coming from Somalia and Eritrea. It says not many Syrians, Afghans or Iraqis are shifting from the Turkey-Greece route to the Central Mediterranean one from North Africa to Italy.